In the diverse world of contemporary music, if One Direction represents the homogeneous high street comprising bland and corporate chain store units, Easter Street is most definitely a serendipitous alternative street with an enticing range of idiosyncratic boutique emporia. In such a townscape each street might contain options of food, clothing and appliance outlets – but those that may be found in Easter Street are far more interesting and captivating. 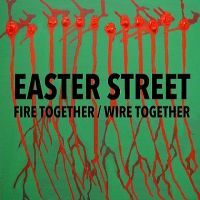 As a band, Easter Street provides a wonderful selection of musical offerings that infuse echoes of many decades. I was able to sense influences from the 1960s similar to Neil Young’s Crazy Horse – does this have anything to do with singer/gutarist Derek’s Canadian heritage? I was also reminded of 1970s glam rock, although having seen the band play on a number of occasions I would be very surprised to see them donning satin flares and platform boots. Other eras are detectable with hints of Manic Street Preachers and Muse to name a couple more. Having listed these other bands does not infer that Easter Street simply aim to replicate the sounds of others; rather, like the best, they appear to have soaked up a range of influences in order to produce their own unique sound. This is their second album; following 2012’s ‘Cause And Effect’ this provides a further progression and showcases their tremendous musical talent. At times they present as a classic power trio; Derek’s virtuoso guitar is extremely accomplished but not narcissistic and overbearing, Murray’s bass is solid and complex whilst Daniel’s driving beats on the drums finish off a perfect combination. In addition the intelligent lyrics are delivered with Derek’s distinctive vocals, supplemented by interesting harmonies and some subtle keyboards. One track is particularly evocative and with its lilting accordions and acoustic guitars it wouldn’t be out of place at Celtic Connections or similar locations. Being a local band and having seen them play live simply adds to my enjoyment of this marvellous recording, particularly as I had the privilege of them playing one of the tracks in public for the first time during an acoustic session in the studio during my 24 hour radio show last September.